Polaroid SX-70: END OF AN ERA? It's been a long time since my last post - almost three years to be precise. The end of Polaroid's film-making days has been the writing on the wall for several years now but it's now official. As of three days ago, Polaroid is officially out of the instant film market. 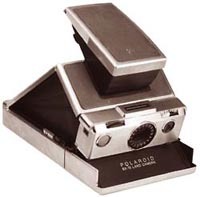 That occurrence has been the cause of much sadness and reflection, including a great piece by the New York Times' Michael Kimmelman that I think captures the romance and magic of the Polaroid (and the beloved SX70 more specifically). A friend, coincidentally, also sent me this remarkable story from Mental Floss magazine about someone who took a polaroid almost every day of his life, starting in March of 1979, through October 25, 1997 (the day he died of cancer). Meanwhile, there's an on-going campaign to save Polaroid film called, um, "Save Polaroid". People write me asking, where can I get film for this camera? and besides eBay (which I don't normally recommend), the only other place currently selling that I could find is Polapremium.com. They sell 8 shot packs of SX70 TZ Artistic Film (which means it can be manipulated) for $21 (not including shipping). That's definitely a bit price but given the finite supply, I can't blame 'em. I had been using the SX70 Blend which I think works fine but I'm not clear if it's still being sold or not but you can try here. People have also asked me about adapting the 600 film to use in the SX70. I looked into it back when that "solution" was first proposed but personally, I don't like it. It "works" in terms of being able to take instant photos with it the hack but the need for a filter adjustment plus having the manipulate the pack just seems like you're setting yourself up for more trouble than it might be potentially worth. If people have experience with that however, feel free to share. Someone asked "is it possible to get a brand-new SX70?" and the answer is: "not exactly." You might be able to find a never-used-before SX70 off of eBay but Polaroid stopped making the camera itself decades ago. In general, I would never recommend you buy an SX70 that hasn't been tested - it's fragile enough that any number of mechanical problems can occur with them and you don't really want to chance buying a busted one. Despite the fact that the film for them has dried up, they still sell surprisingly well on eBay. I'd suggest folks look there but just make sure you know which model you're looking for. I never liked the white-and-tan models (which were 3rd or 4th gen). I prefer either the first gen or Alpha 1s. i have recently been turned on to the sx-70 (thanks to flickr). what a wonderful pieces= of machinery! i am so tempted to get one, even though film supply is rapidly dwindling. thanks for the links to the articles!